Today feels like a real adventure. A journey into a land of fire and oil, mountains and mud. While not necessarily a recommended destination for journalists, Azerbaijan is certainly a fascinating place for travellers. And virtual travel, of course, just makes it easier to get around. A former Soviet republic, Azerbaijan is bounded by four countries — Russia, Georgia, Armenia and Iran — and the romantically named Caspian Sea. Turkmenistan and Kazakhstan lie just across the water from the capital, Baku. With the (mostly treeless) Great Caucasus mountain range to the north, uplands to the west and 800 kilometres of coastline to the east, there is huge variation in the landscape. Lowland coastal marshes lie well below sea level, while along the subtropical southeastern coast, rolling hills are home to citrus groves and tea plantations. It’s these kind of contradictions that really interest us about a potential destination. Actually it was my suggestion initially, but as soon as Leroy heard the rousing words mud volcanoes and fire temple, he was in. All I had to do was add Zoroastrianism and baklava to the mix and he was putty in my hands. Home to over two million people, Baku is really three cities in one: the UNESCO-listed Inner City, the Soviet-built city and the new city. We arrived in the medieval walled Inner City, prepared for the warmth and humidity, but a little surprised by the gusty wind. We usually like to have breakfast as soon as we arrive; as a way to acclimatise and get a feel for a place before our main explorations begin. Today was no exception. Around the corner we found the small café recommended by a friend of ours, and ordered a traditional Azerbaijani breakfast of sweet butter, various white cheeses (some saltier and stronger than others), cream, honey, preserved fruit, tea and kuku. 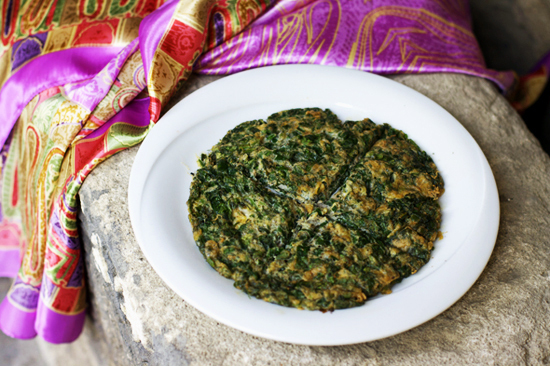 Kuku resembles a kind of frittata, also made with beaten eggs and herbs. Except that that it’s really more about the herbs than the egg. So much so that the end product is green and the egg is merely a binding agent to keep the herbs together. Luckily I love herbs with a passion and our kuku was very tasty, garnished Persian-style with walnuts and zereshk (barberries). We also had a chat to the proprietor Kerem and his adult daughter, Seva. As Seva demonstrated how to drink tea in Azerbaijan (in decorative glasses with jam and lemon slices), she also explained a little about the Azerbaijani people. Apparently the Azeris, with their Persian, Turkic and Russian influences, make up most of the population but are joined by Lezghins, Russians, Anatolian Turks, Avars, Tatars, Georgians and Ukrainians to create the culturally diverse nation it is now. University educated and obviously proud of her country, she didn’t mention politics and we didn’t pursue it. After breakfast we explored the Inner City, including the Palace of the Shirvanshahs, a 15th century royal retreat beautifully constructed from pale sandstone. We also dropped by the centuries-old stone Qız Qalası (roughly translated as ‘Maiden’s Tower’). There’s some debate over just how old the tower is, but the additions to the current structure are from the 12th century. 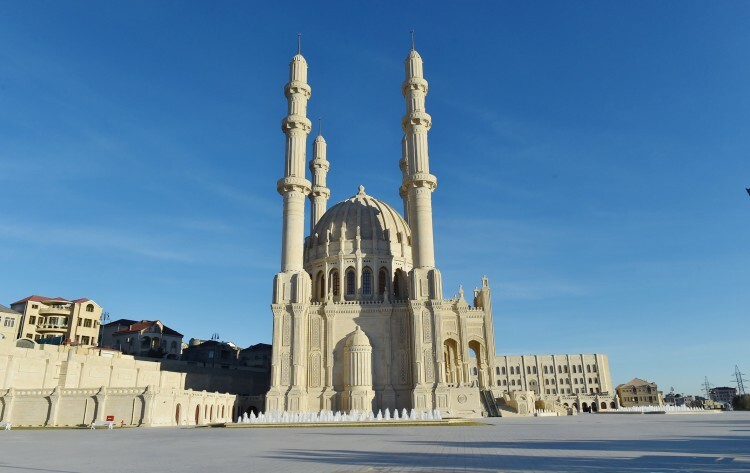 The Maiden’s Tower is one of Baku’s main attractions along with the Baku Ateshgah (also known as the ‘Fire Temple of Baku’), which was used as a Hindu and Zoroastrian place of worship, and the Heydar Mosque. We had time for a brief visit to both, promising that we’d come back another time. Perhaps even in real life. It was already apparent that we were only going to scratch the surface in one day. From the old city we headed over to see Zaha Hadid‘s astounding Heydar Aliyev Cultural Centre. 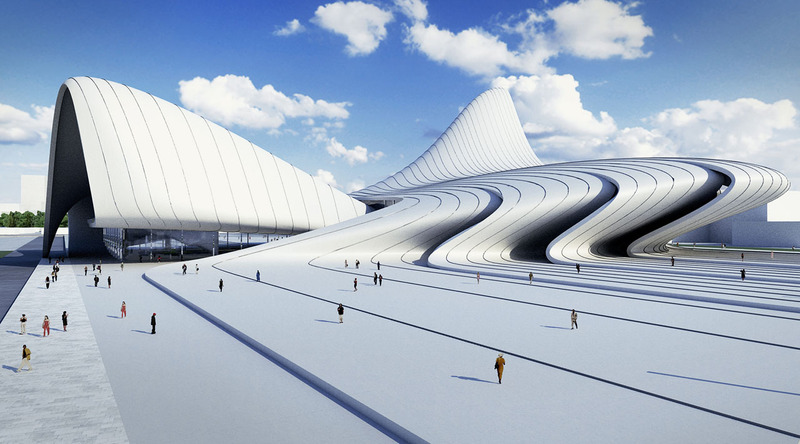 Contemporary, sculptural and magnificent — and blindingly white. Even with sunglasses, I had to squint to see where I was going. The interiors are equally amazing, although I was possibly more of a fan than Leroy. 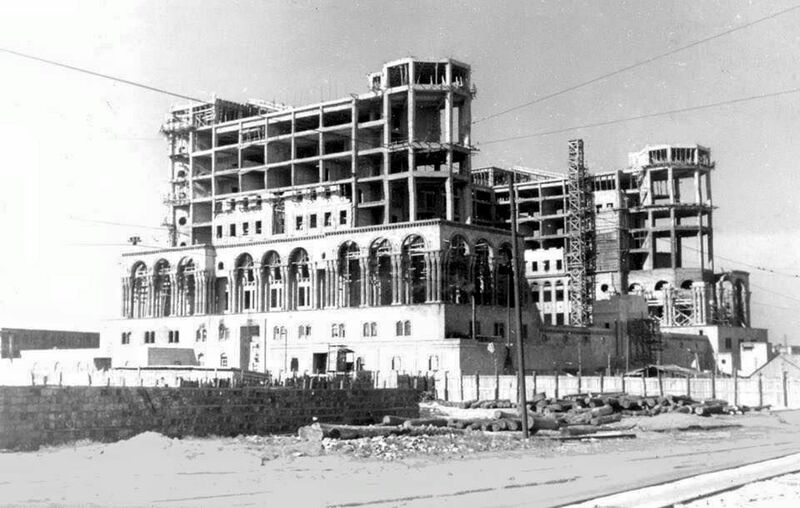 Sadly, many of the Soviet era buildings were demolished for oil-backed urban renewal projects in the lead up the 2012 Eurovision Song Contest. And most of the Soviet monuments had been removed after 1991. 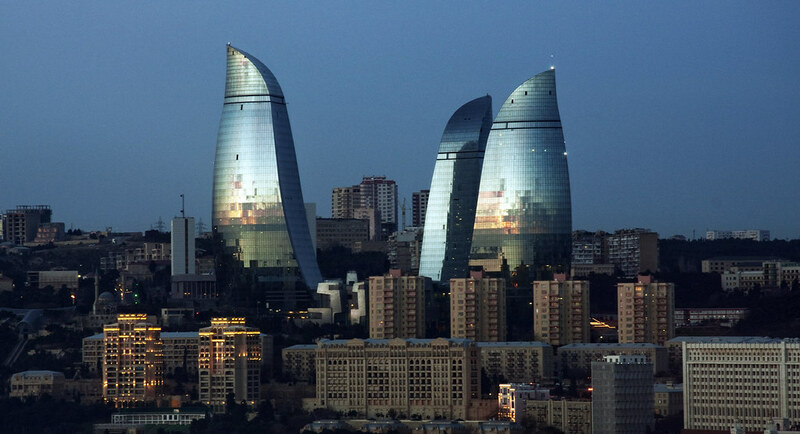 Baku was the fourth largest Soviet capital until the collapse of the USSR in 1991, mostly thanks to its oil reserves in and around the Caspian Sea. We were hoping to see some crazy Constructivist architecture, but the Stalinist buildings that remain are fairly conservative. Built between 1936 and 1952, the former Palace of the Soviets — now House of Government — is a good example, incorporating an unusual mix of Baroque, Socialist Realism and Asian influences. My favourite Soviet thing of all, though, was the Baku Metro. We’d already explored the better known Moscow Metro system last year, but the Baku metro stations (‘people’s palaces’) were a real surprise. A gorgeous mix of elaborate styles and colours that would rival Moscow’s. We had already decided to give the Naftalan health centre in western Azerbaijan a miss (a decision that took all of half a second), as we had very little desire to bathe in crude oil. Many Azerbaijanis swear by its effects, but it wasn’t for us. Not even as something to add to our future autobiographies. Instead we headed off to the ravine-filled Gobustan National Park (officially named the Gobustan Rock Art Cultural Landscape) in search of mud volcanoes and mineral springs. A drive down the coast from Baku would normally take an hour but we utilised the perks of virtual travel and arrived in no time at all. Over half of the world’s 700 mud volcanoes are located in Azerbaijan, caused by petrochemical gases building up under the earth and finding a weak spot in the crust to break through. Every 20 years on average, the volcanoes erupt with huge force, shooting flames way into the air and dropping tonnes of mud onto the surrounding area. The landscape of the park is like nothing I’ve ever seen before. A vast treeless plain covered in small peaks, some with their tops blown off and craters filled with pools of cold grey mud, bubbling and spurting into the air. Unlike New Zealand’s Rotorua, there was no overwhelming smell of sulphur in the air. Leroy and I wandered around for ages, hardly seeing a soul, before we set off to find the park’s famed petroglyphs. 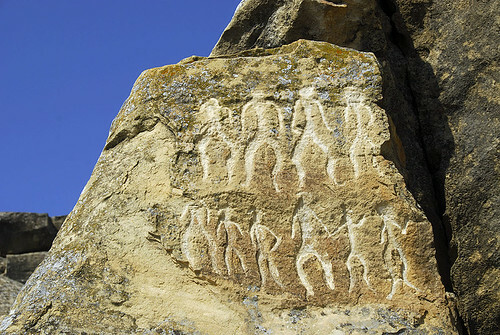 Around 6000 images of the sun and stars, people, animals, ritual dances, bullfights, boats with armed oarsmen, warriors and camel caravans have been found carved into the boulders. Many have been dated to 40,000 years. There are also the remnants of inhabited caves and settlements from people who lived there after the last Ice Age. Highly recommended for anyone interested in anthropology. Even though the shadows were getting longer and we really should have been heading back to Baku to meet up with Seva and her friends, Leroy was keen on finding the Qavaldaş first. 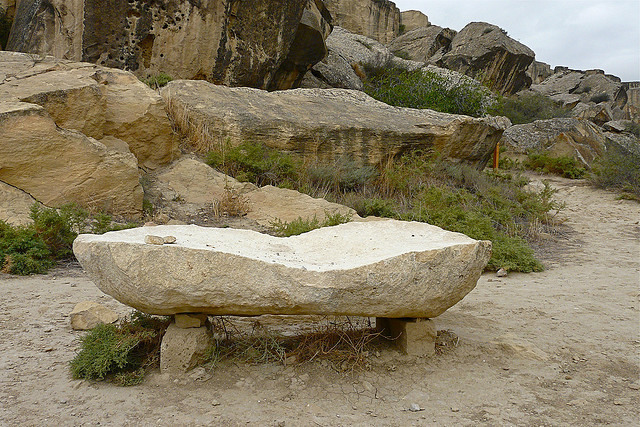 There must be an unusual combination of factors in the environment of Gobustan, because some of the rocks have extraordinary resonating qualities that are hard to imagine without hearing them being ‘played’. While we search for the best-known of them, here’s a YouTube video of an Azerbaijani percussion group giving it a red hot go. Once we find the stone (if we find the stone), we’ll be zipping back to Baku and donning our finery. We’re taking Seva and two of her friends out for dinner. She has promised us modern Azerbaijani food and a view of the iconic Flame Towers, the trio of blue-glass skyscrapers that tower over the city and change colour. Apparently Baku glitters at night and I can’t wait to see it.